Antique shopping in Cleveland and the surrounding area is like a treasure hunt. The region boasts many fine antique galleries as well as antique salvage stores and thrift stores where one just might find a single treasure amidst piles of ordinary articles. Cleveland has a rich history as the Western Reserve territory of Connecticut in the late 18th and early 19th centuries and furniture and articles from that era are still found in the region. In addition, Ohio and West Virginia pottery, from makers such as Roseville, Shawnee, and Hall are frequently found in antique shows and at estate sales in Northeast Ohio. Antique Shopping in Cleveland: Where to Go? Lorain Avenue - This three-mile section of west side Cleveland thoroughfare, Lorain Avenue is home to a collection of antique salvage emporiums. Shop here for that leaded glass window to add to your new addition, or antique door hardware - even the door itself. The shops tend to be dusty and disorganized, but that's part of the charm. 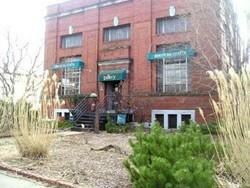 Larchmere Boulevard Antiques District - Located on Cleveland's east side, this two-mile stretch is home to dozens of antique shows as well as art galleries and interesting eateries. Among the highlights are Sylvia Ullman's American Craft Gallery (pictured above), a showcase for regional potters, glass artists, painters, and work workers; Shaker Square Antiques (pictured below), one of the most elegant - and expensive - antique galleries in the city; and the Thriftique, a funky thrift store with everything from early 20th century wooden furniture to lava lamps to collectible LPs. Northeast Ohio flea markets are not just about junk and inexpensive items. Some offer pottery, old (but interesting) books, local memorabilia, and even produce. Some of the best area flea markets are the Hartville Ohio flea market, a year-round market of over 1000 vendors, located south of Cleveland in Northeast Ohio's Amish country; the Elyria Flea Market, held year-round on Fridays, Saturdays, and Sundays in the town of Elyria, just west of Cleveland; and the Greenacres Park n Swap, held year-round on Wednesdays, Saturdays, and Sundays in South Amherst Ohio, west of Cleveland. Dunham Tavern Antique Show - The Dunham Tavern Antique Show has been held each Thanksgiving weekend for 111 years. The quality show is a fund-raiser for Dunham Tavern, the oldest original structure in Cleveland and now a museum. Items at the sale include oriental rugs, pottery, fine china and glass, and antique jewelry. It's wonderful to look as well as buy. 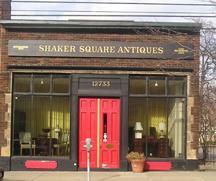 The sale is held at Shaker Heights Middle School in the eastern suburb of Shaker Heights. Admission is $7 per person. Early risers can attend the preview breakfast for $25, which includes early admission to the show as well as a Continental breakfast. Western Reserve Antique Show - This quality antique show, in its 25th year, is held on Labor Day on the campus of Western Reserve Academy in the southeastern suburb of Hudson Ohio. The one-day event features over 120 exhibitors, selling Ohio antiques, folk art, early toys, garden art, oriental rugs, and lots more. Admission is $8. 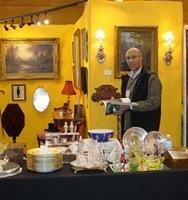 In addition, antique enthusiasts can take advantage of the early-shoppers breakfast. For $20, early risers get a hearty pancake breakfast and a first chance to shop. Yankee Peddler Festival - This ever-popular folk art festival sets up for three consecutive weekends in the fall, just outside of Canal Fulton Ohio, about an hour's drive from downtown Cleveland. The fair, set in a wooded lot, features folk art - more antique and modern - as well as hand-crafted items. You'll find quilts; wrought-iron work; wooden cribs and dolls; and blown glass objects. There's also live entertainment, period costumes, and lots of delicious food.